These decorated sugar cubes are great for adding those "special touches" to a party or that much needed relaxing cup of tea! You can choose from a floral mix or a fruit and fun mix. 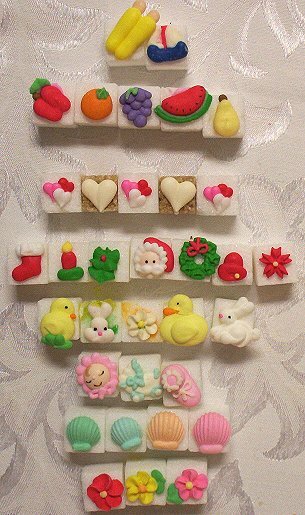 There will also be seasonal decorated sugar cubes for Valentine's day (Jan. & Feb.), Easter (Mar. & Apr. ), Thanksgiving (Oct. & Nov.) and Christmas (Nov. & Dec.).